Some royal brides wear historical tiaras, some get new tiaras on their wedding days, and others, like Sophie Rhys-Jones, get a combination of the two. 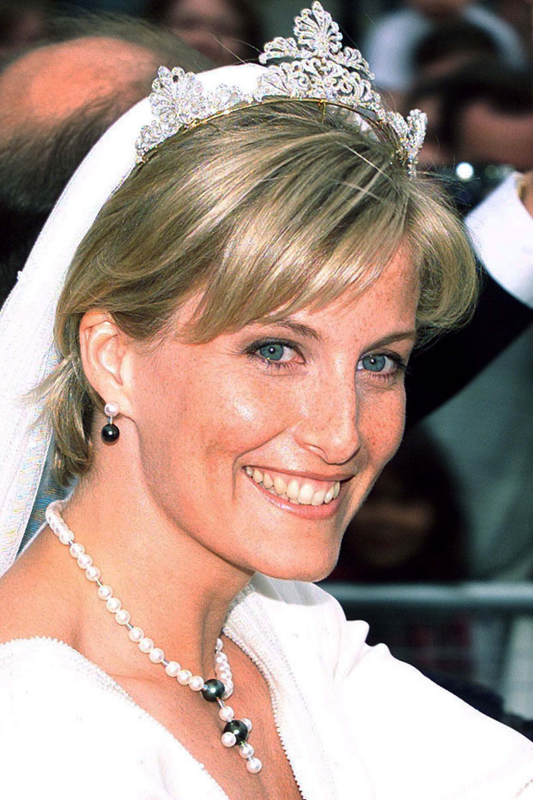 For her 1999 wedding to the Earl of Wessex, Sophie (who celebrates her birthday today) was gifted a new tiara made from antique pieces. The palace has never confirmed the provenance of the tiara, other than noting that it came from the private jewelry collection of the Queen, but there's one prevailing (and convincing) theory about its construction. That theory states that the tiara is composed of four anthemion elements that were originally alternative pieces of Queen Victoria’s Regal Circlet. The circlet was made with a set of detachable fleur-de-lis, Maltese cross, and anthemion elements that could be swapped out and rearranged. One of the anthemions was designed to accommodate one of the greatest diamonds from Victoria's era: the Koh-i-Noor, which is currently set in the Queen Mother's Crown. Although there is no photo of the Regal Circlet with the anthemions attached, the case for the diadem includes spaces for elements identical in shape and size to those on Sophie’s wedding tiara. The Regal Circlet was stripped of its diamonds in the 1930s, and only its frame remains intact today. (The frame is currently at the Museum of London.) Repurposing the remaining anthemion elements was a clever way of giving Sophie a new tiara that still had echoes of previous royal generations. It's the royal jewel version of reduce, reuse, recycle. 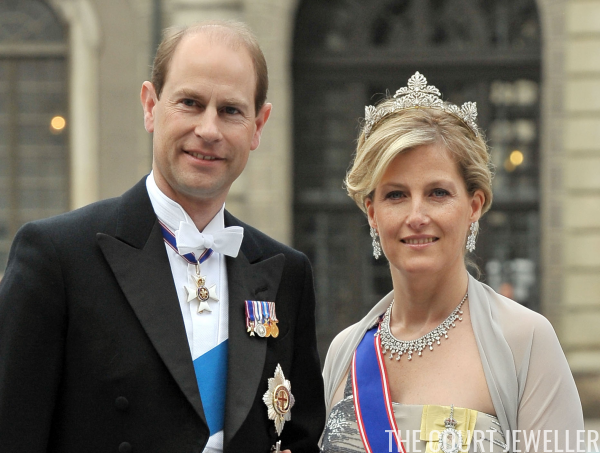 Since her wedding day, Sophie has worn the tiara several times, including at many European royal weddings. 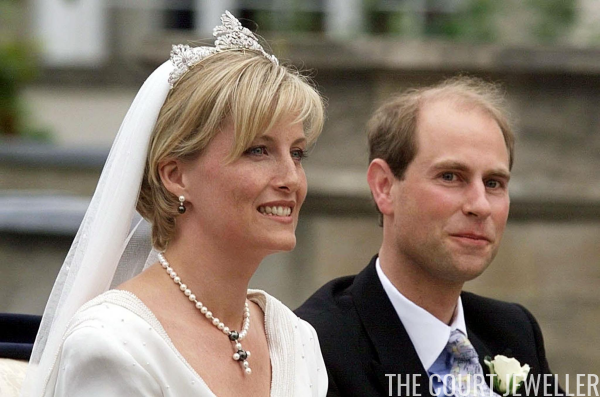 She and Prince Edward are the queen’s go-to representatives at these events abroad, so this wedding tiara has seen many more weddings since its initial outing. 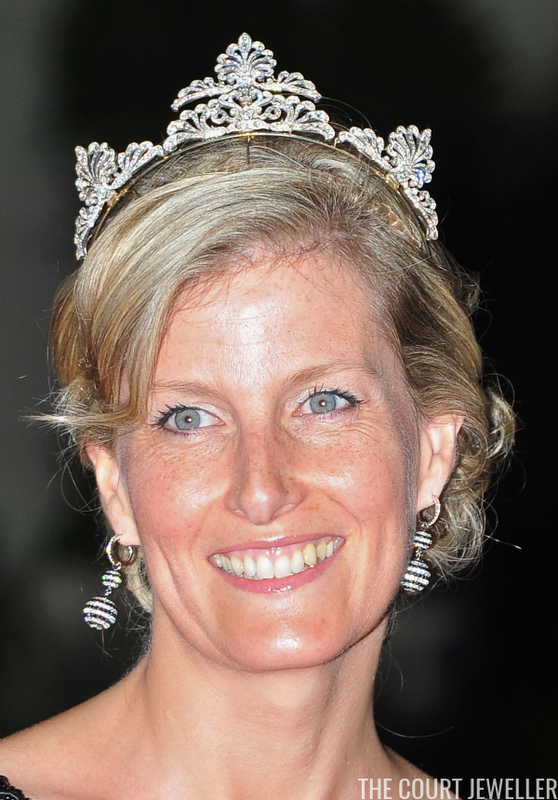 Above, Sophie wears the tiara at the royal wedding in Denmark in 2004. She also wore the tiara at the wedding of Crown Princess Victoria and Prince Daniel of Sweden in 2010. 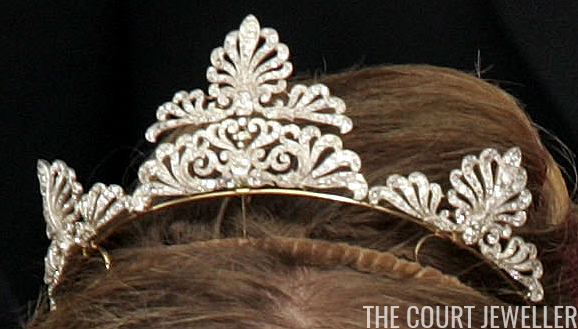 But since Sophie's tiara collection has begun to expand, the wedding tiara has slowly been relegated to the back of the vault. One of its last major appearances came during the princely wedding in Monaco in 2011.